Frequently Asked Manual Testing Interview Questions And Answers. Frequently Asked Manual Testing Interview Questions And Answers. Top 20 Manual Testing Interview Questions For Freshers And Experienced. Latest Manual Testing Interview Questions. Verification: process of evaluating work-products of a development phase to determine whether they meet the specified requirements for that phase. Validation: process of evaluating software during or at the end of the development process to determine whether it specified requirements. 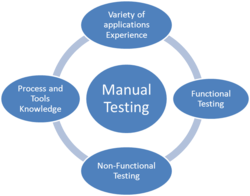 Verification is Static Testing where as Validations is Dynamic Testing. Verification takes place before validation. Verification evaluates plans, document, requirements and specification, where as Validation evaluates product. Verification inputs are checklist, issues list, walkthroughs and inspection ,where as in Validation testing of actual product. Verification output is set of document, plans, specification and requirement documents where as in Validation actual product is output. Explain Branch Coverage and Decision Coverage. Branch Coverage is testing performed in order to ensure that every branch of the software is executed atleast. To perform the Branch coverage testing we take the help of the Control Flow Graph. Decision coverage testing ensures that every decision taking statement is executed atleast once. Both decision and branch coverage testing is done to ensure the tester that no branch and decision taking statement, will not lead to failure of the software. Branch Coverage = Tested Decision Outcomes / Total Decision Outcomes. Retesting is done to verify defect fix previous in now working correctly where as regression is perform to check if the defect fix have not impacted other functionality that was working fine before doing changes in the code. Retesting is specific and is performed on the bug which is fixed where as in regression is not be always specific to any defect fix it is performed when any bug is fixed. Retesting concern with executing those test cases that are failed earlier where as regression concern with executing test cases that was passed in earlier builds. Retesting has higher priority over regression. What is Mutation testing & when can it be done? Competent programmer hypothesis: according this hypothesis we suppose that program write the correct code of the program. Coupling effect: according to this effect collection of different set of test data can also find large and complex bugs. In this testing we insert few bugs into program to examine the optimal test inputs. What is severity and priority of bug? Give some example. Priority: concern with application from the business point of view. It answers: How quickly we need to fix the bug? Or how soon the bug should get fixed? Severity: concern with functionality of application. How much the bug is affecting the functionality of the application? If a company logo is not properly displayed on their website. Suppose you are doing online shopping and filled payment information, but after submitting the form, you get a message like "Order has been cancelled." If we have a typical scenario in which the application get crashed, but that scenario exists rarely. There is a mistake like "You have registered success" instead of successfully, success is written. Explain bug leakage and bug release ? Bug Leakage: When customer or end user discovered a bug which can be detected by the testing team. Or when a bug is detected which can be detected in pervious build then this is called as Bug Leakage. Bug release: is when a build is handed to testing team with knowing that defect is present in the release. The priority and severity of bug is low. It is done when customer want the application on the time. Customer can tolerate the bug in the released then the delay in getting the application and the cost involved in removing that bug. These bugs are mentioned in the Release Notes handed to client for the future improvement chances. Monkey testing is a type of Black Box Testing used mostly at the Unit Level. In this tester enter the data in any format and check the software is not crashing. In this testing we use Smart monkey and Dumb monkey. Smart monkeys are used for load and stress testing, they will help in finding the bugs. They are very expensive to develop. Dumb monkey, are important for basic testing. They help in finding those bugs which are having high severity. Dumb monkey are less expensive as compare to Smart monkeys. 0 on: "Frequently Asked Manual Testing Interview Questions And Answers."